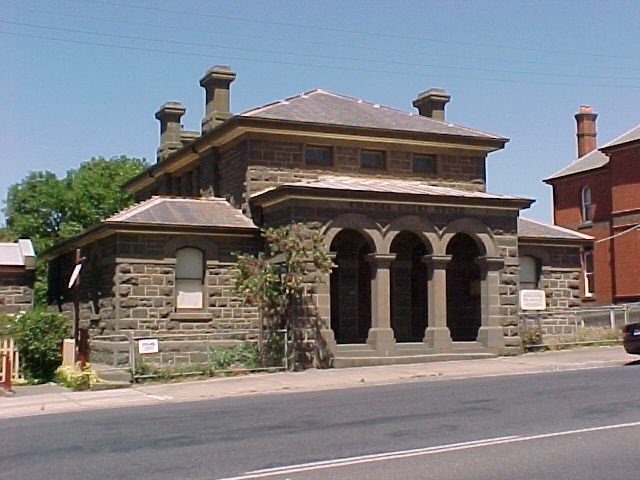 The Court House, Kilmore, erected in 1863, was designed by J J Clark under the supervision of William Wardell of the Public Works Department and constructed by Langridge and Co. The building, built of coursed basalt rubble and rock faced basalt masonry, consists of a double height courtroom with a hipped slate roof that is flanked by lower wings and entered through an arcade porch. An attic storey is suggested by windows above the porch roof. Two basalt columns and two pilasters, carry the three arches of the porch: all are executed in dressed stone, contrasting with the rock face masonry behind. Three pairs of double doors, originally solid, and now half-glazed open from the porch: semi-circular fanlights surmount each pair. The building's style is evocative of the Italian Renaissance, sometimes referred to as the Victorian Romanesque style of architecture. Alterations were carried out on the building in 1888. Police court sittings commenced in Kilmore in about 1850 and in 1854 county court and general sessions began. This continued until 1916 and subsequently only petty sessions have taken place. The Court House, Kilmore, is of historical and architectural significance to the State of Victoria. 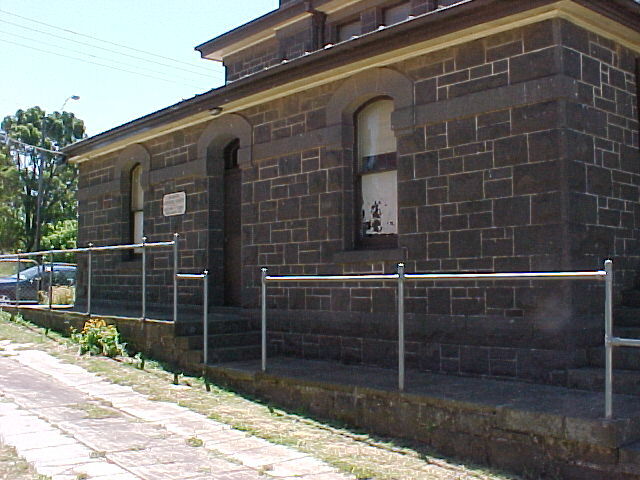 The Court House, Kilmore, is historically significant for its early date of construction. 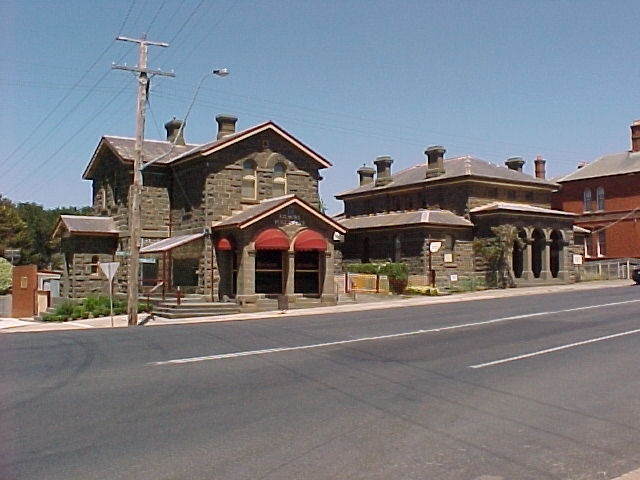 The building is also important for its association with the earliest development of Kilmore township which is Victoria's oldest inland town and the most important staging post between Melbourne and the goldfields of Heathcote, Bendigo and Rushworth. The court house is historically significant for demonstrating the spread of law and order across the state, which is indicative of the progress of Victoria's development. The building is important for their relationship with the nearby police station, barracks and post office which together form an example of an early government precinct. 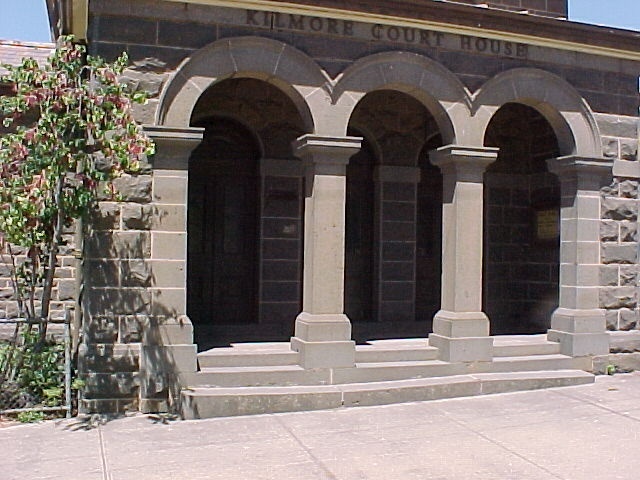 The Court House, Kilmore, is architecturally significant as an example of a restrained design by the prominent architect, J.J. Clark in the Victorian Romanesque style architecture as applied by the then Public Works Department to a local court house. Court House, Hume Highway, Kilmore. 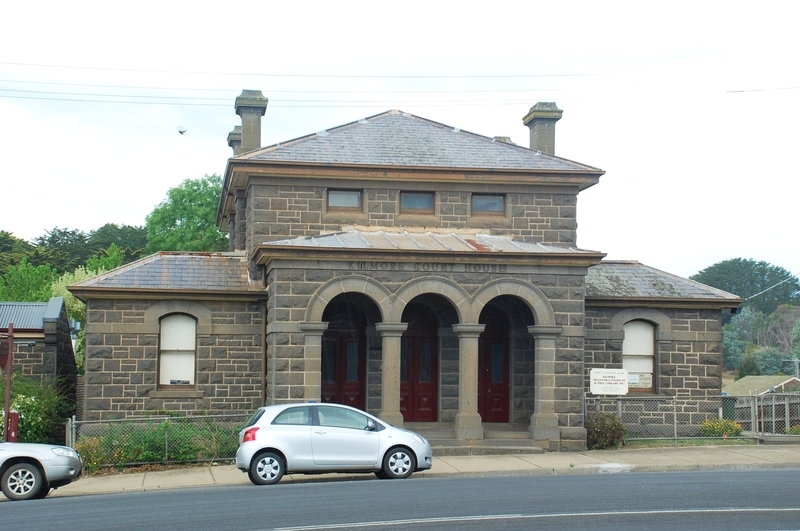 The Court House, Kilmore, erected in 1863, was designed by J J Clarke under the supervision of William Wardell of the Public Works Department and constructed by Langridge and Co. The building, built of coursed basalt rubble and rock faced basalt masonry, consists of a double height courtroom with a hipped slate roof that is flanked by lower wings and entered through an arcade porch. An attic storey is suggested by windows above the porch roof. Two basalt columns and two pilasters, carry the three arches of the porch: all are executed in dressed stone, contrasting with the rock face masonry behind. Three pairs of double doors, originally solid, and now half-glazed open from the porch: semi-circular fanlights surmount each pair. The building?s style is evocative of the Italian Renaissance, sometimes referred to as the Victorian Romanesque style of architecture. Alterations were carried out on the building in 1888. Kilmore Courthouse 1864 and original courthouse built 1856. 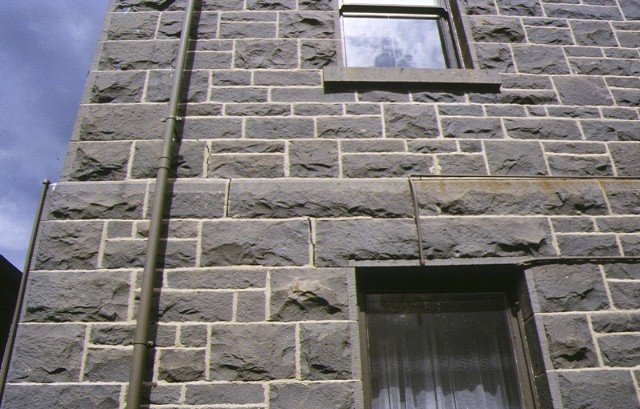 The following newspaper references indicate that the foundation stone of the Kilmore Courthouse building in Powlett Street was laid in November 1863 and the building therefore built mainly and completed in 1864. There are no known copies of the Kilmore Examiner, apart from 6mths of the 1856 paper. However, in 1914 and 1915 the Kilmore Free Press published snippets and excerpts from the other years. Searching of some of the Melbourne papers may reveal an original newspaper article. The excerpt of 11 Dec 1862 does back up the extract reprinted in the 1928 paper. Excerpt from Kilmore Examiner 11 December 1862 printed in Kilmore Free Press 1914. £2500 placed on estimates to build a new court house at Kilmore. The following facts may prove of interest to our readers with reference to the Kilmore Court House which has recently been renovated. We publish them through the courtesy of Mr. W. P. M. Taylor. The late Mr. John Taylor commenced "a scrap book" in the years 1853, that book now a priceless possession of Mr. Taylor's. One could spend hour after hour perusing its yellow pages containing highly interesting extracts from the Kilmore local papers, Melbourne dailies, and other journals of bygone days. "The ceremony of laying the foundation stone of the Kilmore Court House was performed by the members of the Kilmore Masonic Lodge on Saturday, November 28th, 1863. Dr. Nicholson was the Worshipful Master at the time. Under the foundation stone were deposited the following newspapers:--"The Masonic Journal," The Melbourne "Argus," The Melbourne "Age," "The Kilmore Examiner," and numerous current coins of the realm. The building was erected by the Government of the Colony at a cost of £3,600, J. J. Clarke, Esq., being the architect and D. Langridge contractor. Following the lengthy Masonic ceremony which was a most impressive one, a banquet was held. After the usual loyal toasts were given and responded to, the chairman proposed the health of the Mayor and town councillors of Kilmore. Mr. John Taylor, the Mayor (who was the first Mayor of Kilmore), returned thanks and referred to the progress that the town had made and hoped that as new powers were conferred upon the Council by the present Municipal Act that still greater progress might be made, as there remained great room for improvement." Excerpt from Kilmore Examiner 3 December 1863 printed in Kilmore Free Press 1914. D. N. Nicholson W.M., lays the foundation stone of the new courthouse at Kilmore, assisted by the Rev. W. H. Taafe, at which ceremony E. M Cairnes Esq., a local poet, delivered an epilogue. Excerpt from Kilmore Examiner 25 November 1864 printed in Kilmore Free Press 1914). The petty sessions business is now conducted in the new courthouse. Built in 1863-64 to a design by the notable architect J J Clark under the supervision of William Wardell of the Public Works Department, the court house is part of an important early public precinct.